← Brain Food or Useless Fruit? There’s been a young Cooper’s hawk frequenting my yard recently. I see this species in my neighborhood throughout the year, but their visits become more frequent in the winter when I have the bird feeders out. An active bird feeder is like an all-you-can-eat buffet for a Cooper’s hawk (Accipiter cooperii). The accipiters are experts at the fast and precise tactical maneuvers needed to zip in and out of trees and other backyard vegetation where tasty songbirds hide. When I photographed this one the other day, he had a fresh blood spot on his belly indicating a recent meal. Nevertheless, he was still terrorizing the innumerable house sparrows. 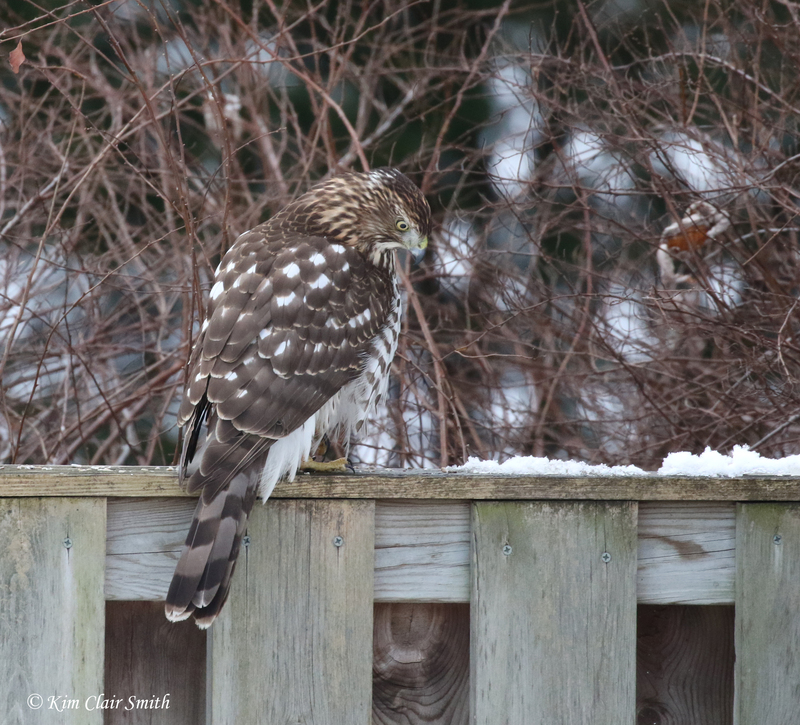 Many bird lovers are dismayed to see a hawk taking birds from their yards, and I get it. Nobody likes to see an animal die right before their eyes. And the first few times I witnessed this behavior it upset me too. But having spent so much time with birds over the years, I’ve made my peace with it. Because a hawk needs to eat just like any other bird does, so I can’t begrudge them taking advantage of an easy meal. Raptors are fascinating birds to study, especially when you get a chance to see them hunting and feeding. I’m excited to be a new volunteer for a raptor monitoring project with Metroparks Toledo this spring, helping to keep track of hawks and owls throughout the nesting season. I’ll go to an orientation meeting next month, and then be assigned a route that I’ll walk once every two weeks to document any raptor nesting activity. 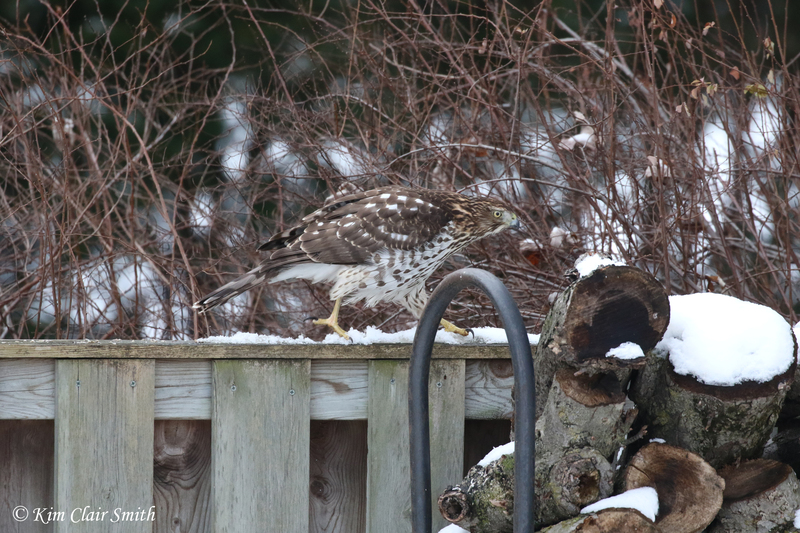 The photo above shows an adult Cooper’s hawk in my yard last winter. If you compare the hawk in the first picture above, you’ll notice that the younger hawk has yellow eyes rather than the reddish eyes of the adult. The head of the mature bird is much darker, and their breast feather patterns are different as well. As for the house sparrows that are often the prey of my backyard hawks, I’m ambivalent about them, as are many birders. You see, these birds are not native to North America; they were originally found in Eurasia, North Africa, and the Middle East. The first 8 pairs of them were released in New York City in the mid-19th century, followed soon after with other releases. Immigrants to this country wanted to establish populations of the birds they were familiar with from their home countries, but they had no way of knowing the problems that would be caused by this seemingly harmless introduction. They quickly established themselves throughout most of North America, often displacing native bird species by their aggressive nesting behaviors. They begin nesting early in the season, often before the native birds have returned from migration, thus depriving them of their preferred nesting spots. Eastern bluebirds are one of the species that has been hardest hit by the impact of the house sparrow invasion. Ask anyone who monitors bluebird nest boxes and you’ll undoubtedly hear exasperation as they tell you about the house sparrows killing bluebird babies and building nests on top of their dead bodies. 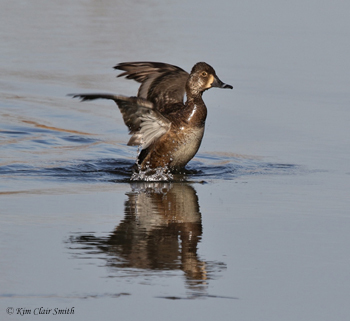 If you’d like to read more about this, check out this article from the Cornell Lab of Ornithology. House sparrows are very adaptable, able to eat a wide variety of foods and to nest in human dwellings. 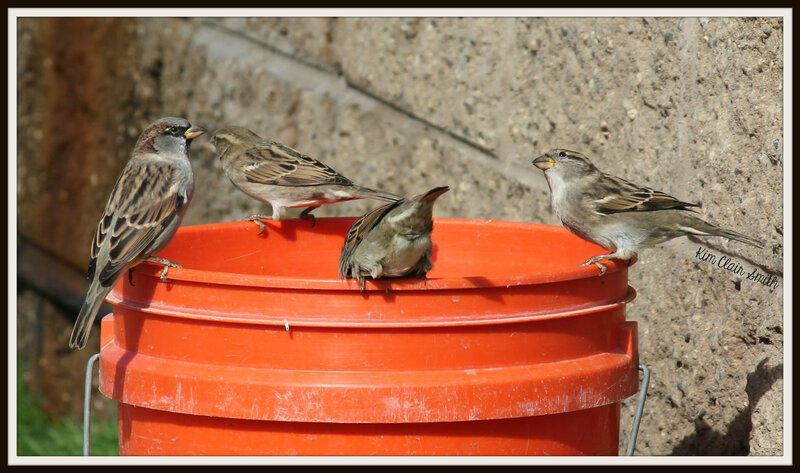 If you’ve ever noticed birds inside your local Costco or other big box store, or noticed nests hanging on the outdoor storefront signs of any business, those are likely to be house sparrows. These birds are the reason I don’t keep my bird feeders out all year long; there’s a large population of them here and they spend much of their time in my yard. They roost in shrubs in the yard, and arrive at the feeders in noisy flocks, pressuring other birds into looking elsewhere for food. I wish they weren’t such a problem, because they’re handsome birds. Well, at least the males are handsome; the females are more drab. Here’s a group of them gathered on the rim of a water bucket at a dog park, with a single male on the left. Finally, here are a few photos of the young hawk walking along the fence, peering down into the sparrows’ favorite roosting spot. He came away with empty talons this time, but I’ve seen Cooper’s hawks jump down into those shrubs and come out with a feathered meal many times. One day I saw two victims pulled out of there, a mourning dove and a house sparrow. I tend to mourn the loss of the dove more than that of the sparrow. Wondering where all those sparrows went….they were just here a minute ago! 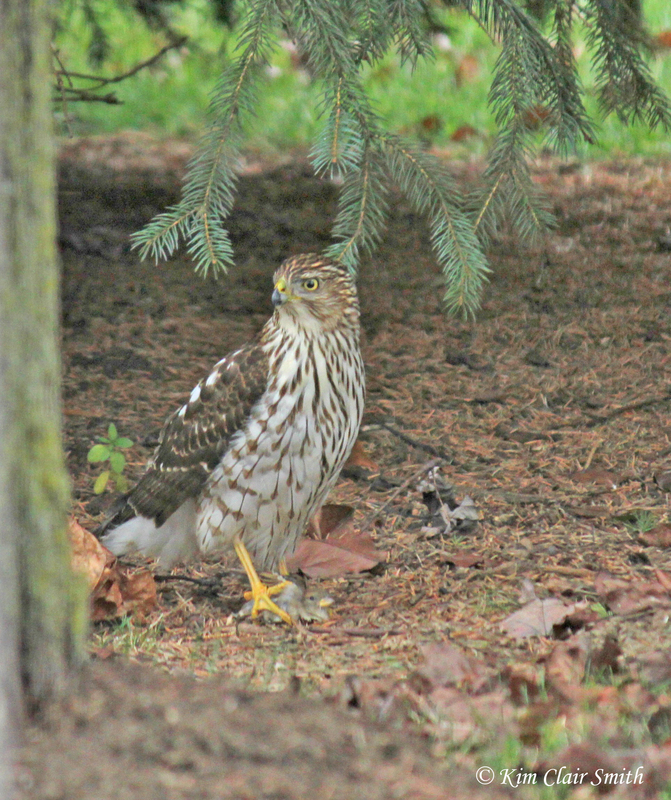 This entry was posted in Birds and tagged accipter, Cooper's Hawk, hawk, house sparrow, hunter, predation, predator, prey, sparrow. Bookmark the permalink. I’m late to the dance in commenting on this, Kim, but wanted to say how much I appreciated this post. You did a wonderful job of explaining the presence of both hawks and house sparrows, and in depicting both with your beautiful photos. Thank you! 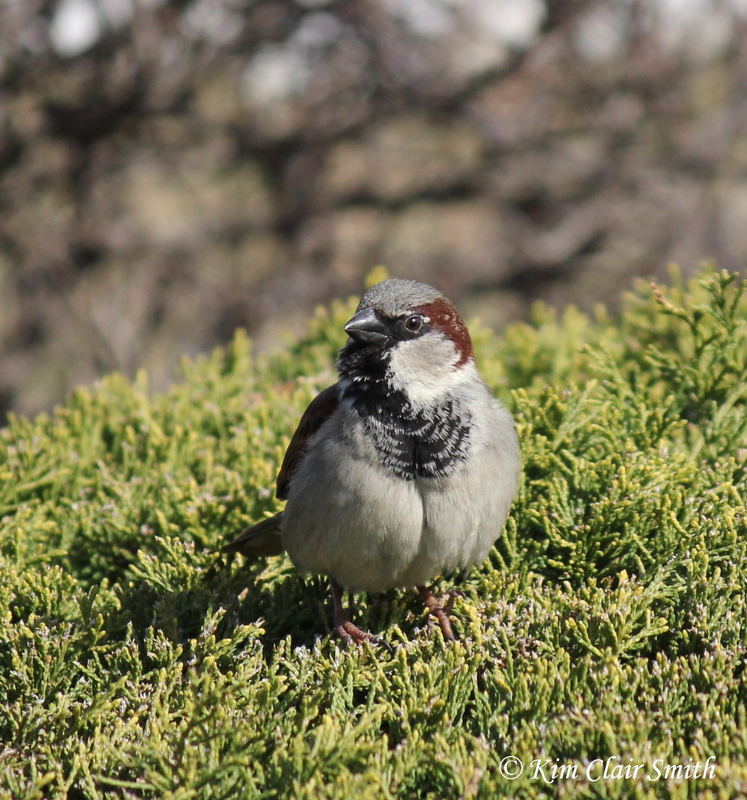 Such an informative post about the Cooper’s and the prolific house sparrow. We finally removed our bluebird box rather than fight the house sparrows all summer. Not only did they attack parents and babies, they pecked holes in the eggs! Oh Annie, I’m sorry to hear that. It’s a never-ending battle, isn’t it? Terrific article and photos, Kim! I always learn so much from you. Thank you Kim, a very informative post. The closest I’ve been to a Cooper’s Hawk was the restaurant chain! They are beautiful birds. We have sparrows here in Australia too but not that many here in Alice Springs. The real nuisance bird here is a native, the Galah. They are funny and pretty, but terrible bullies, and can be very noisy. I put seed out in the summer and keep a very large water bowl here, because that is the hard time of year, especially now with weeks on end of 100+ temps. I wish I could live on just seed and water so I didn’t have to cook! Well I just learned something from you, Ardys — I’d never heard of the Cooper’s Hawk restaurant chain, and I see that there are a few locations in other parts of Ohio. As for the galahs, wow, what a gorgeous bird! I just watched a couple videos of them on YouTube, and they remind me of the large, noisy flocks of parakeets I saw in the Rio Grande Valley of Texas last winter. 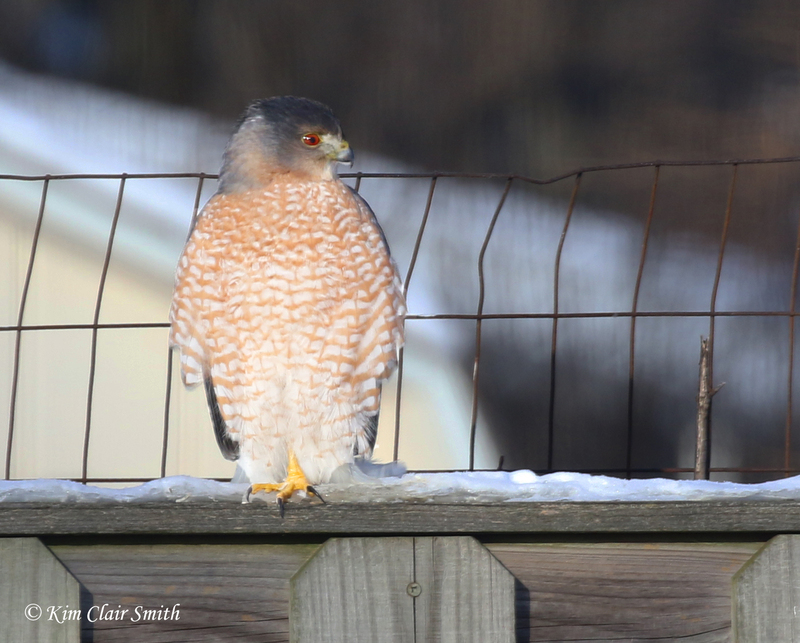 This year we have not only juvenile and adult Cooper’s Hawks but Sharp-shinned as well visiting the feeder birds almost daily. I’m glad when they stick to the House Sparrows, But unfortunately they don’t. 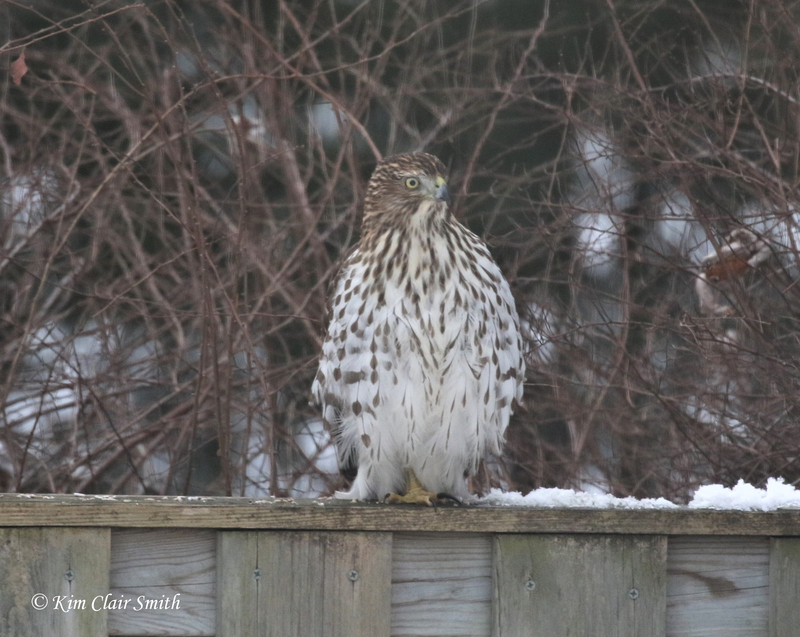 Whenever I look out and see a couple of birds frozen in place on the feeders, I always search for hawks. Great pictures, Kim. Thanks, Gail. I don’t get Sharpies as often in my yard, but sure wish I did. Nice pictures and write-up. We do not see those birds here in town but were surprised yesterday when we turned down N. 8th st. and saw a bunch of robins in the big pine tree on the right. I think you said some stay here all winter but have not seen any since fall. Yes, you can find flocks of robins all winter long, usually in trees with some kind of berries. Very nice series of images Kim! And the narrative that goes with them! 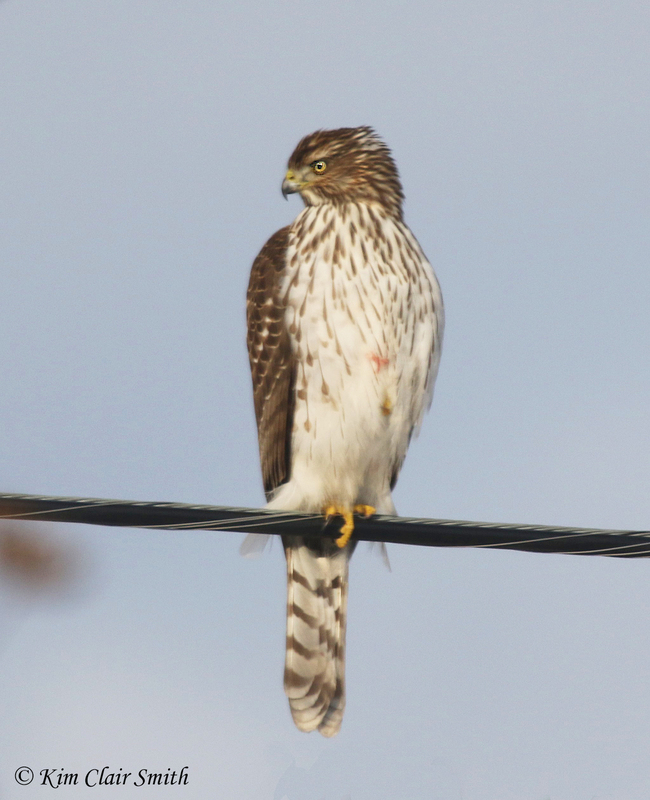 I recently read a report that said feeders are what has enabled the Cooper’s Hawk to come back in such numbers. The feeders bring together plenty of meals for them. I enjoyed your post. Thanks, Lisa. Yes, I’ve seen those articles too. The abundance of feeders, along with the ban on DDT, has allowed these beautiful birds to recover nicely.